I'm not the first expatriate, immigrant, or tourist to find myself treading carefully in a new culture. The last thing I want to do is offend the people that are my neighbors, no matter how long I intend to stay in a certain place. Whether a week in India, a year in Busan, or a lifetime in the states, I have always tried to live my life in a way that is harmonious to the lives of others around me. Courtesy. Empathy. Compassion. I don't want to make someone feel uncomfortable because of something I have said or done. This mindset has never before bubbled so close to the surface with such consistency as it has the last six months here in Korea. I've been careful about how I eat, what I eat, what I wear, where I put my chopsticks after my meal, how I greet people. Almost every element of daily life that I take for granted when home I have been hypersensitive to as I find myself in such a drastically different place. I'm not saying that is not a bad thing. That is how I have learned to live in the Korean way (or as close to it as a non-Korean speaking foreigner can). However, at some point I have let this sensitivity to these cultural differences stop me from living my life. I have let my new city stop me from doing the things I want to do to live forward and work ahead in my career. As this page is titled, I am a wandering musician. I play the flute. 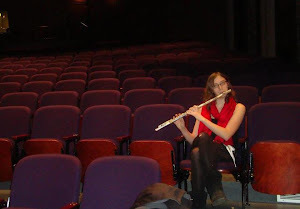 I am a classically trained orchestral musician. With this title comes a huge responsibility: practicing. Practicing daily. Practicing when you don't want to. Practicing the things that sound terrible. Running drills, scales, arpeggios. Technical work that I love. Long tones that are low. Long tones that are high. Long tones that seem like they will never end. Breathing exercises. Yoga. Meditation. The first six months in Korea I barely touched my flute. I felt a bit lost. I was caught up trying to figure out my future career because I was ignoring the one that I truly loved. I was trying to change who I am into something I'm not. This is not Koreas fault. I am not blaming my location. Instead it was a complex culmination of countless different factors that have been building since before I finished my Masters degree. But therein lies a different blogpost. Right now I'm looking forward. I've stopped being afraid of offending my neighbors and have picked up my instrument again. I'm applying for festivals, masterclasses, and orchestral auditions. I'm practicing (within decent hours), I'm exercising (outside of those decent hours), and I'm living my life in the truest form that I can. You see I'm still being sensitive to my neighbors. I don't play my flute before 8 am or after 9 pm. I refrain from high piccolo work in my apartment (because really, nobody deserves that torture). I'm still conscious of cultural difference and carry myself in a way that resonates with these new cultural norms. But I am no longer changing all of who I am to make sure that others are happy. This was never my intention, but it was essentially what was happening. It's time for me to do me. It's time for me to live shamelessly because that is who I am. It's time to live unapologetically. Good for you Krystle. Good luck with your future endeavors.